One of the things I have been wanting to do for quite some time, is to do some proper analysis on Burnthrough Lasers (BTL). They are an interesting set of weapons because they are very hard to get an intuitive grasp of, because of the run-away effect of criticals. I will now try to delve into this starting with some general thoughts. My main project for some time, have been to make a proper analysis tool for pitting any weapon system against any ship and calculate odds for crippling, outright killing, etc. to get at better feeling for the individual weapons. The main challenge in making that as an spreadsheet have been BTL since the individual dice rolls are not independent. So to make that tool, first I needed to create the weapons profiles. After having worked a little on the problem in excel I realized, that unless I wanted to do macros (which I dislike), Excel was not gonna cut it. It would be so much better to make a small algorithm to analyze this and then feed the final profile into Excel. Though I do work in the software business, it has been quite a few years since I coded anything and I ended up learning a bit of Ruby as that seems rather straightforward. I made a small script on some 100-and-so lines where I can input the weapon profile and get the probablities for any given distribution of hits and criticals as output. 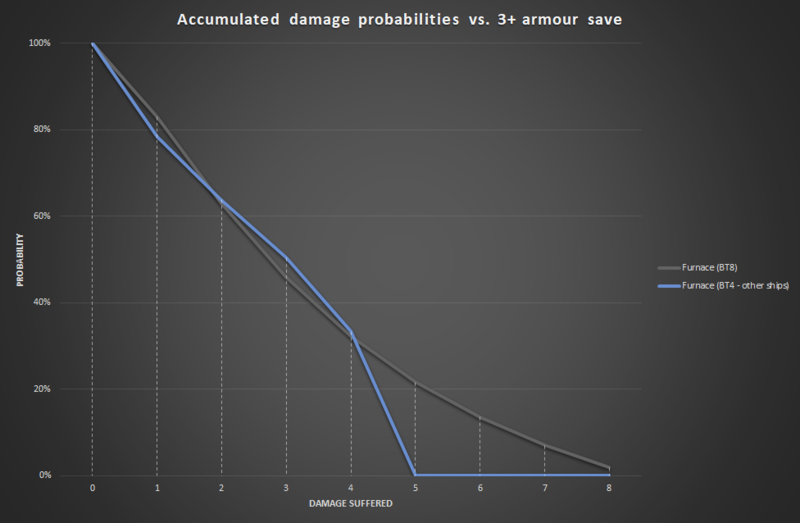 This I can then feed Excel to add on information about armour saves, etc to get a proper damage distribution. 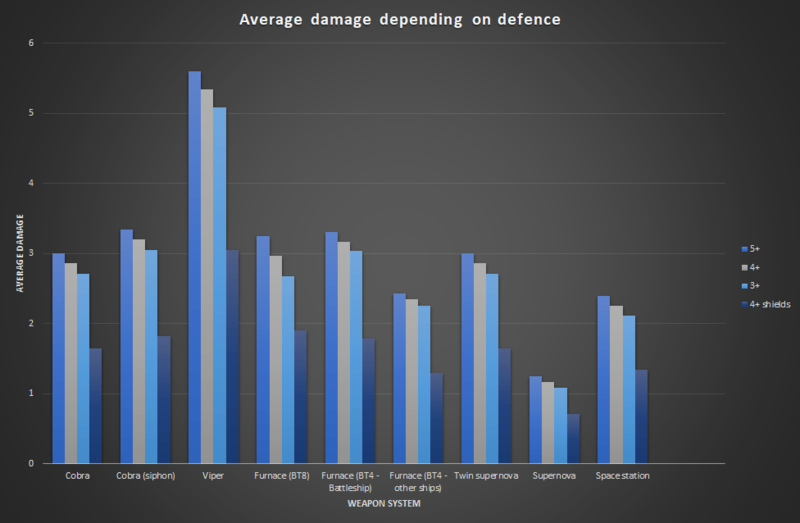 For the current different types of BTLs the average damage against different armour types can be seen below. Let’s go through the most interesting observations, fleet by fleet. The “Siphon Power” rule of the Cobra is almost irrelevant. 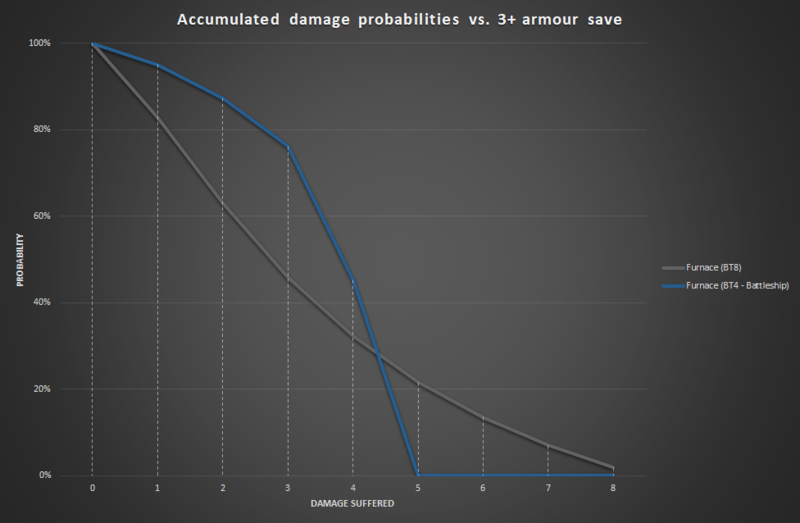 The average damage is about 11 % higher but (unsurpisingly) this is driven by being able to cause 7 or 8 damage which – in turn – requires that the target can absorb that amount of damage. If the target can absorb no more than 6 damage the added damage for this rule is only about 5 %. All lin all, it seems to me that the “siphon power” rule have failed to make the St. Petersburg any more relevant. The Viper is in a class of itself. This is of course especially relevant with targets that can absorb large amounts of damage and the accumulated change of causing a critical hit against an undamage cruiser (not including shaltari with shields up) is somewhere between 52,3 % and 66,7 %, depending on the cruisertype. This is – unsurprisingly – mainly born by the immensly large chance of criticals with the most likely result (16,6 % chance) being 7 criticals and 1 normal hit. The interesting question with the scourge is which of the alternate profiles to go for. For all ships except battleships, the question seems rather straightforward. The average damage of the BT 8 variety is considerable better than for BT 4 – somewhere between 19 % and 47 % (unsurprisingly, 47 % is against shields where criticals – BT4s strength – are irrelevant). This is in no small part due to the ability to cause 5+ damage and there is a fringe case fighting damaged vessels (or frigates) with high armour where the BT 4 is better but if that is hard to remember, then just cling to the simple rule of BT 8. The downside here is the missing flash effect but for pure damage – especially against shielded shaltari – go for BT 8. But another interesting piece of information can be spotted for the BT 4 effect on the battleships. This is heavily improved compared to the other BT 4 and damage is now as much as 12 % better than BT 8 (3+ armour saves) but underperforming against the shields. Combining with Flash effect that makes BT 4 the obvious choice in all situations except against shaltari shields. I have little to say here. The Supernova is a huge gamble damage-wise with somewhere between 37,6 % and 51,9 % chance of doing no damage at all. Its main role seems to be to light up targets with the flash effect (which it has 66,7 % chance of) but it does seem rather pricy for that particular role. The Twin Supernova is identical to the Cobra but the role is quite different, so they are actually hard to compare. First of all, the Cobra is the worst BTL in UCM whereas the Twin Supernova is the best in PHR. In any case, I don’t think of the Twin Supernova as the main weapon of neither the Hector nor the Bellerophon but rather the option of being able to do some damage while approaching (Hector) or staying away (Bellerophon). Wait – shaltari has no BTL? Yes, that’s true, but I still have a relevant observation. BTLs primary strenght is the ability to cause disproportionately many critical hits compared to all other weapons. Take the Cobra (or Twin Supernova) – it does an average 0,87 normal hits but 2,43 criticals – thats 2,8 times more criticals – only weapons with Calibre (H&S) special rule and a very good lock can achieve better ratios. This means that shields are by far the superior defence against them – and that good armour is a considerably less effective defense. So while the Shaltari have no BTLs of their own, they are without a doubt the fleet best suited to defend against them. The change to BT4 was a good one. This reduced the average damage with about 20 % and hence made it less lethal. It also made sure that it was unable to create a crippling roll on an undamage cruiser – a crucial limitation. So what more could be interesting? I have looked at the initial observations, but a couple of interesting questions presents itself. How does BTL compare against the alternative weapons on those slots? Both against heavy armour but also against shields? How does two Supernovas acting independently perform compared to a single Twin? What tweaks could be done to make the Viper more in line with the other weapons? These questions I will address in my next post about BTL.